Substitute Louis Longridge scored a penalty immediately as Dunfermline secured victory at Ayr United. The spot-kick came after a handball by Michael Rose, who only arrived 20 minutes before kick-off due to traffic. Michael Moffat's bullet header went narrowly wide as the hosts hunted an equaliser. Ayr stay second but have fallen further behind championship leaders Ross County with the gap opening to five points. Dunfermline move up to sixth after recording their second win in a row under manager Stevie Crawford. It's only Longridge's second appearance in 2019 after groin and knee injuries, but what a contribution from the bench as he continues his return to full match sharpness. Ayr United manager Ian McCall said: "I don't think either team deserved to win. The first half-hour we played well, but second half we were terrible, awful, and there wasn't enough urgency in our play. We're very disappointed. 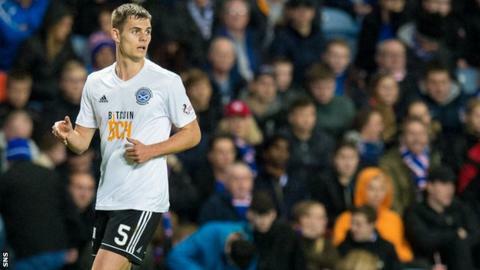 "Lawrence Shankland is still getting up to speed again and were we too reliant on him? I don't know. It's a sore one to take at home but we have no divine right to win." Dunfermline Athletic manager Stevie Crawford said: "They were causing us a lot of bother in the wide areas, to the extent we changed our shape and went with a flatter midfield four. "It wasn't one of our best performances but there's been signs of togetherness with two clean sheets to give us confidence. "Louis's got good energy and good awareness and I'm delighted he's got his goal because it's been a frustrating few months for him." Match ends, Ayr United 0, Dunfermline Athletic 1. Second Half ends, Ayr United 0, Dunfermline Athletic 1. Attempt missed. Myles Hippolyte (Dunfermline Athletic) left footed shot from outside the box is close, but misses to the right. Myles Hippolyte (Dunfermline Athletic) wins a free kick in the defensive half. Attempt missed. Lawrence Shankland (Ayr United) right footed shot from the centre of the box is just a bit too high. James Craigen (Dunfermline Athletic) is shown the yellow card for a bad foul. Calvin Miller (Ayr United) wins a free kick on the right wing. Attempt missed. Michael Moffat (Ayr United) header from very close range is close, but misses to the right. Bruce Anderson (Dunfermline Athletic) is shown the yellow card. Substitution, Dunfermline Athletic. Myles Hippolyte replaces Bruce Anderson. Bruce Anderson (Dunfermline Athletic) has gone down, but that's a dive. Substitution, Ayr United. Jamie Adams replaces Steven Bell. Foul by Lawrence Shankland (Ayr United). Attempt missed. Louis Longridge (Dunfermline Athletic) right footed shot from outside the box misses to the left. Attempt blocked. Joseph Thomson (Dunfermline Athletic) right footed shot from outside the box is blocked. Goal! Ayr United 0, Dunfermline Athletic 1. Louis Longridge (Dunfermline Athletic) converts the penalty with a right footed shot to the bottom right corner. Penalty conceded by Michael Rose (Ayr United) with a hand ball in the penalty area. Substitution, Ayr United. Declan McDaid replaces Robbie Crawford. Substitution, Ayr United. Calvin Miller replaces Nicky Cadden. Joseph Thomson (Dunfermline Athletic) wins a free kick in the defensive half. Substitution, Dunfermline Athletic. Louis Longridge replaces Aidan Connolly. Foul by James Vincent (Dunfermline Athletic). Corner, Ayr United. Conceded by Danny Devine. Attempt saved. Aidan Connolly (Dunfermline Athletic) right footed shot from very close range is saved in the centre of the goal. Robbie Crawford (Ayr United) wins a free kick in the defensive half.